The ongoing problem of acid rain causes injury, slow growth, or sometimes death of trees. Some soils are able to buffer the acidity effectively. Other soils, however, lack an effective buffering capacity, putting trees at risk. While acid rain can directly damage leaves, it also shifts soil pH, making soil nutrients unavailable to plants. Acid rain can also release the aluminum in soil. Trees are then able to take up the aluminum, which is toxic to them. Trees in alpine regions are more at risk, even if they have buffering soil. The clouds that bathe the mountain tops are acidic, subjecting the trees to more acidity than trees at lower elevations. A ray of hope, please. As has been shown in research done by Cornell University, mycorrhizal fungi can help to protect some trees from the effects of acid rain. Through the hyphal network of mycorrhizal fungi, the trees has access to a greater amount of calcium — a nutrient made less available by acid rain. Unfortunately, not every tree will form associations with mycorrhizae, leaving those trees most vulnerable. Additionally, mycorrhizae will not prevent acid rain from leaching toxic aluminum out of the soil. Calcium amendments to your soil will help to make the nutrient more available for trees. Bone meal, powdered eggshells, or powdered oyster shells can help to boost the calcium available to trees. In humans, arsenic causes arsenicosis which causes skin problems including skin cancer, bladder, kidney and lung cancer, disease to the blood vessels of the legs and feet which can lead to gangrene, and is suspected to contribute to diabetes, high blood pressure, and reproductive disorders. [Source WHO] The WHO’s Guideline Value for arsenic in drinking water is 0.01 mg /litre. The problem of arsenic in drinking water can be tackled by harvesting rainwater – a strategy routinely advocated in permaculture. Arsenic also affects agriculture in two ways: arsenic is drawn into plants contaminating the plant; and arsenic is drawn up instead of phosphorus, which is a major limiting factor in plant growth. The result is a plant that has a degree of toxicity and is stunted due to lack of phosphorus. When groundwater irrigation is utilised in areas with arsenic contamination, these problems appear. The use of swales, or water-harvesting ditches on contour, is the most cost effective type of earthworks for capturing water. It also reduces or eliminates the need for groundwater irrigation. Arsenic (As) contamination of irrigation water represents a major constraint to Bangladesh agriculture. While arbuscular mycorrhizal (AM) fungi have their most significant effect on P uptake, they have also been shown to alleviate metal toxicity to the host plant…. Plant height, leaf/ pod number, plant biomass, root length, shoot P concentration/offtake, root P offtake and mycorrhizal infection decreased significantly with increasing As concentration. However, mycorrhizal inoculation reduced As concentration in roots and shoots. This study shows that growing lentil with compatible AM inoculum can minimise As toxicity and increase growth and P uptake. A pot experiment was conducted to examine the roles of indigenous and non-indigenous arbuscular mycorrhizal (AM) fungi in As uptake by maize (Zea mays L.) from original As-polluteded [sic] soil, and their effects on As and P fractions in the rhizosphere…. All results indicate that indigenous consortia M2 could protect their host plants from the toxicity of excessive As through P nutrition by activating P, though non-indigenous M1 could alleviate As toxicity through stabilizing As and P in the soil. It is reasonable to expect that other plants that form mycorrhizal associations would also have reduced arsenic uptakes from Glomus species and likely Acaulospora species as well. In arsenic-contaminated regions, it would be a good idea to inoculate soils with Glomus species and avoid practices that hinder mycorrhizal growth (ploughing, adding synthetic nitrogenous fertilisers, addition of too much phosphorus). Fungi are a vital component of soil life constituting 70% of the biomass in healthy soils. Within a gram of healthy soil, there are between 10 and 20 million fungi and between 3 and 300 metres of fungal hyphae (roots)! There are three categories of fungi: saprophytes, mycorrhizal fungi and pathogens. Pathogens, as the name suggests, are the harmful fungi that do damage to plants and are the source of many plant diseases. Saprophytes (often called saprotrophs today), are decomposers. Though they make up less than 1% of soil fungi, they are important in recycling carbon, nitrogen, phosphorus and potassium. When you pile on the sheet mulch or do chop-and-drop mulching, saprophytes go to work breaking down that material and turning it into soil. 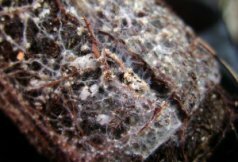 Mycorrhizal fungi are a plant’s best friend. What is really important for us in permaculture are connections. The hyphae of mycorrhizal fungi connect not only fungus to one plant but multiple plants. Furthermore, these mycorrhizae are the conduit for photosynthates (sugars and other carbohydrates that are the product of photosynthesis) and nutrients between plants of different species. Some fungi can even help certain species of tree better survive acid rain by assisting in the uptake of calcium. Additionally, fungal hyphae also encourage beneficial bacteria. This soil life creates the vital crumb-like structure of healthy soil. Such soils are more easily penetrated by air, water and plant roots. Additionally, because soil with a crumb structure holds water better, it is more drought proof and less prone to water-logging. Among the mycorrhizae are endomycorrhizae, which enters right into the cell wall of plants’ roots to exchange nutrients, and ectomycorrhizae, which pass between root cells but do not enter the cell wall. One of the limiting factors to plant growth is the uptake of phosphorous. 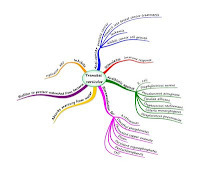 This is where mutualist mycorrhizae become vital. They scoop up the phosphorous in the soil and supply it to plants. The plants in turn supply the fungi with sugars. Not every plant responds to mutualist fungi, however. Among plants that don’t are members of the amaranthaceae (think amaranth and Chinese spinach) including its subfamily chenopodiaceae (think beets and chards), many brassicaceae (the mustard family which includes broccoli, cauliflower, cabbage, kale, brussels sprouts, turnip and others), theaizoaceae family (iceplant) and the cyperaceae family (bulrushes, sedge, papyrus, etc.). Knowing this, one might see a pattern of degraded lands with poor mycorrhizae having many of these plants in them. Such lands can be repaired by deep mulching and innoculating the soils with samples of healthy soils. Also, soils that are high in sodium, chlorine, boron, cadmium, zinc or manganese can be detrimental to fungi. Highly acidic soils damaged by acid rain may lead to the formation of aluminum sulfate or aluminum nitrate which is toxic not only to plants but to fungi as well. To promote fungal life which leads to healthy soils, plant cover crops that will provide a permanent host for mycorrhizal fungi, avoid disturbing the land (ie. no-till agriculture), avoid the use of artificial fertilizers and do not use herbicides or pesticides. Would Christmas be what it is without mushrooms? I’d like to put forward to you that Santa Claus himself owes at least part of his existence to the mushroom Amanita muscaria. First, let’s have a look at Santa Claus. Santa is based on the Dutch figure Sinterklaas. 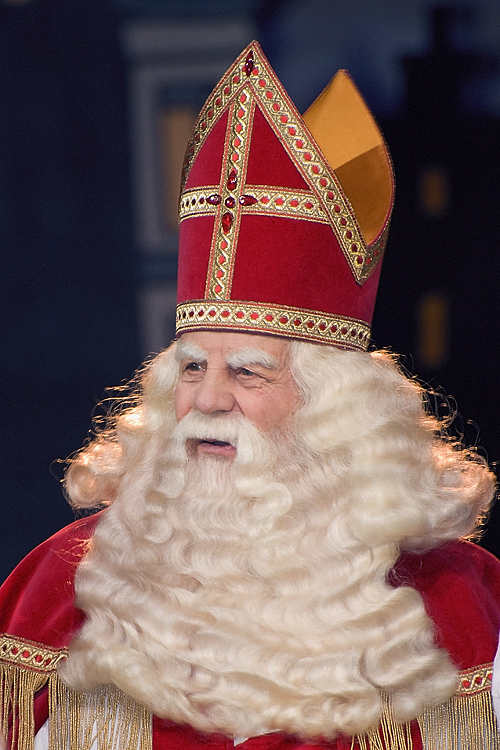 Sinterklaas owes some of his legend to the patron saint of children, Saint Nicholas. Nicholas had a fondness for gift-giving, making him a popular figure in life and death. Unlike Sinterklaas, Odin has one eye, having given up the other as payment for a drink from the well of knowledge. What one sees when one cuts the stem off an Amanita muscaria and looks at its underside resembles an eye, much like the one Odin would have left in the well as payment. And our mushroom hero in this story is revered by many cultures as a giver of wisdom due to its psychotropic properties. Odin’s chariot is visible in the night sky as the Big Dipper, which contains the North Star, which in turn shows the way to the North Pole. The North Pole, as we know, happens to be the home of Santa Claus. I think I’ve made a decent case for connecting Santa to Odin, but not Amanita muscaria to Norse culture, or Santa. Not yet, anyway. 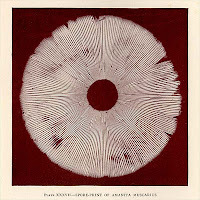 Amanita is a mycorrhizal fungi, meaning that it forms symbiotic partnerships with plants, helping to supply the plant with water and essential nutrients, and helping it to share resources and information (such as warnings about impending pest attacks) with other plants. In return, it gets sugars from the plant. simultaneous states of wakeful consciousness and lucid dreaming. Another common report is a deeply moving spiritual experience. Considering this, it is not surprising that the mushroom is revered in many cultures around the world. It has a tradition of use among the Norse, some of whom took it in very large quantities to become fierce berserks or berserkers. Odin was said to have a berserkergang of his own to follow him in battle. No doubt it was a relief to Norwegians when the berserk practice was outlawed in 1123 AD. Across Siberia it was highly sought, and its rarity there saw it traded sometimes at a rate of one reindeer to one mushroom. This is a daring exchange to make, considering the fact that reindeer go crazy for this mushroom and will scramble to get at it. One might imagine that someone ingesting the mushroom and watching reindeer might just possibly see them fly. The Athabaskans also have a tradition of using the mushroom as do the Afghans. In researching this, I came across a 1979 article in Afghanistan Journal in which one elder of the Shutul Valley in Afghanistan fittingly described his experience of the mushroom as thus: “Once, I thought I was a tree.” The Shutul people also use it as a treatment for frostbite and psychotic conditions. Considering that muscimol acts on the GABA-A receptor, it’s likely that this “psychotic condition” mentioned by the Shutulis is depression. 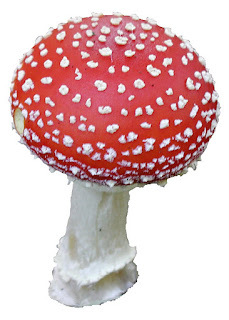 The late eminent ethnomycologist, Gordon Wasson, put forward the theory that “soma,” the sacramental substance mentioned in the Hindu holy book Rig Veda, was, in fact, Amanita muscaria. This is certainly plausible, though the exact composition of soma was kept a secret to prevent it from falling into the wrong hands. There is another curious connection between Christmas and Amanita muscaria. 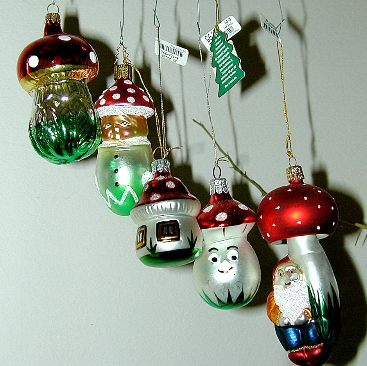 In Europe, it is very common to see Christmas trees decorated with Amanita muscaria ornaments. While the colour scheme matches, it think there is a deeper cultural connection to the mushroom and makes it show up for Yule celebrations. So let’s recap. We have this Santa Clause chap who happens to be dressed in Amanita muscaria camouflage. Santa is based on Sinterklaas, who is based on Odin. Odin, with his flying horse, his acquisition of wisdom, and his berserkers, comes from a culture steeped in the mushroom. Santa travels via flying reindeer – the very same beast that itself has a remarkable affinity for the mushroom, as well as historically being swapped for it. Finally, we’ve got people making replicas of the mushroom and using it as a decoration to celebrate the most wonderful time of the year. Believe what you want to believe. Me? I’m going to nod my head in respect for this mighty mycological miracle. Being a mushroom nut, it has taken all the discipline I can muster not to have a fungal species as Species of the Month yet. I can wait no longer. 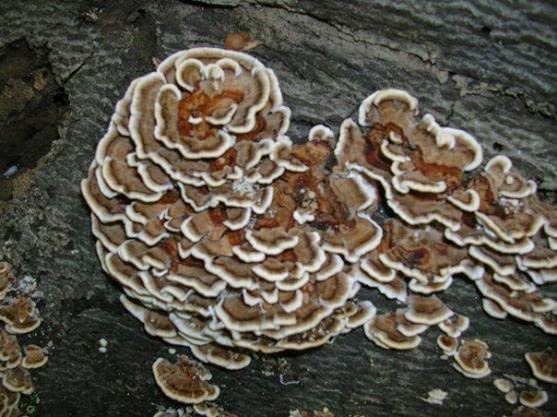 This month’s species is Trametes versicolor, the turkey tail or yun zhi mushroom. This saprophytic, polypore mushroom is a white rot mushroom, meaning that it breaks down lignin (the organic polymer that gives trees their strength). This mushroom is found in boreal, temperate, sub-tropical and tropical regions. It has multiple uses. In the field of health, it has been shown to combat cancer. The cancer drug Krestin, also known as polysaccharide K or PSK, is derived from T. versicolor. It has anti-tumour properties, inhibiting cancer cell growth. It inhibits leukemia cell growth. Alcoholic extracts of T. versicolor are used to help fight prostate cancer. It stimulates the immune response. It helps the spleen recover from gamma radiation. PSK has antibiotic properties against E. coli, Staphylococcus aureus, Pseudomonas aeruginosa, Candida albicans, Cryptococcus neoformans, Listeria monocytogenes, and Streptococcus pneumoniae. In-vitro studies show it inhibiting HIV replication. It has many uses for bioremediation. It can be grown on woodchips in burlap bags. The bags can then be stacked in runoff channels below animal paddocks to filter E. coli, Listeria, Candida and Aspergillus, protecting watersheds from contamination. 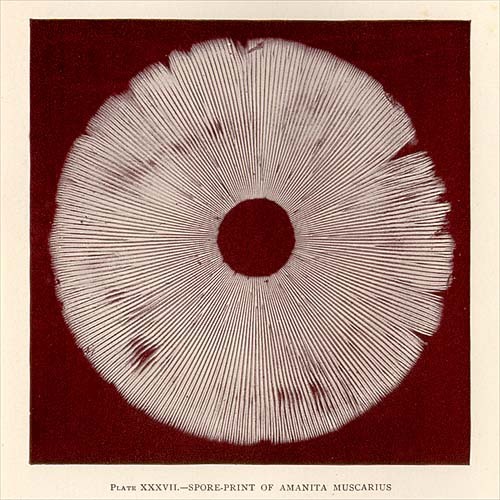 The research of mycologist and permaculturist Paul Stamets suggests T. versicolor might be effective in out-competing pathogenic fungi like Armillaria spp., Sparassis crispa and Hypholoma capnoides. Heat-killed mycelium of T. versicolor has been used to absorb up to 97% of mercury ions from water, suggesting its value to clean water systems. It is also very valuable in either breaking down or bioaccumulating some of the worst manmade pollutants in our environment, among them antracenes (used in dyes, wood preservative, naphthalene and other products), chromated copper arsenate (used in pressure-treated lumber), dimethyl methylphosphonates (used in VX, sarin and soman chemical war agents), dioxins, persistent organophosphates (used in pesticides), pentachlorophenols (used in pesticides and preservatives), and TNT. This fungi grows well on hardwood, including apple and cherry (unlike other fungi), as well as on fir, pine, spruce, larch, cypress and juniper. It can be harvested in the wild (in which case, only pick 25% of a patch of turkey tails), or cultivated on logs raised off the ground or in pots filled with sand. Tree stumps can also be used to cultivate turkey tails. It produces mushrooms annually from spring to late fall, though mushrooms usually appear most in the late summer. The mushroom itself is very tough and leathery, and you will need a knife to harvest it. It can be boiled and used in soups or drunk as tea. The flavour is a little bitter, but compared with many other polypore mushrooms, the bitterness is mild. In a soup with other flavours, the bitterness will go unnoticed. Here we look at two recent discoveries showing how mycorrhizal inoculation can help plants better survive drought and salinisation. In one study (Marulanda, A, et al. Drought tolerance and antioxidant activities in lavender plants colonized by native drought-tolerant or drought-sensitive Glomus species. MICROBIAL ECOLOGY), researchers looked at drought-tolerant species of the mycorrhizal fungi Glomus (namely drought-tolerant strains of Glomus intraradices and Glomus mosseae ) and their effects on drought-tolerant Lavandula spica (lavender). Drought tolerant strains of Glomus intraradices showed 35% greater root mass growth in the lavender compared to the regular strains of G. intraradices. And the drought tolerant Glomus mosseae showed 100% greater root mass compared to regular strains of G. mosseae. Other beneficial effects included an increase in water content in the plant and decreases in antioxidants which would hurt plant health in times of drought. Plants with the drought tolerant strain also had higher levels of nitrogen and potassium compared to the non-drought tolerant Glomus species. I think one could reasonably expect that the less drought tolerant strains would still be better than an absence of any mycorrhizal fungi. Nevertheless, the drought resistant strains would be a very useful and welcome addition to arid and semi-arid systems. This study compared the effectiveness of four arbuscular mycorrhizal (AM) fungal isolates (two autochthonous presumably drought-tolerant Glomus sp and two allochthonous presumably drought-sensitive strains) on a drought-adapted plant (Lavandula spica) growing under drought conditions. The autochthonous AM fungal strains produced a higher lavender biomass, specially root biomass, and a more efficient N and K absorption than with the inoculation of similar allochthonous strains under drought conditions. The autochthonous strains of Glomus intraradices and Glomus mosseae increased root growth by 35% and 100%, respectively, when compared to similar allochthonous strains. These effects were concomitant with an increase in water content and a decline in antioxidant compounds: 25% glutathione, 7% ascorbate and 15% H2O2 by G. intraradices, and 108% glutathione, 26% ascorbate and 43% H2O2 by G. mosseae. Glutathione and ascorbate have an important role in plant protection and metabolic function under water deficit; the low cell accumulation of these compounds in plants colonized by autochthonous AM fungal strains is an indication of high drought tolerance. The second study on the effects of Glomus fasciculatum on the salt tolerance of Acacia nilotica (Giri, B, et al. 2007.Improved tolerance of Acacia nilotica to salt stress by arbuscular mycorrhiza, Glomus fasciculatum may be partly related to elevated K/Na ratios in root and shoot tissues. MICROBIAL ECOLOGY), higher nutrient levels were observed in trees inoculated with the mycorrhizal fungi Glomus fasciculatum where soil was salinated. The United States Department of Agriculture considers soil over 4 dS/m to be “saline soil.”The study looked at uninoculated trees and inoculated trees at salt levels of 1.2, 4.0, 6.5, and 9.5 dS per metre. In the inoculated plants, higher biomass in root and shoot was observed, showing that fungi assisting in plant growth. Inoculated trees had higher levels of phosphorus, zinc and copper than their uninoculated counterparts. And interestingly, in the lower levels of salt, inoculated trees took up more sodium (1.2 and 4.0 dS/m) than the control trees. At higher levels (6.5 and 9.5 dS/m), the sodium levels decreased whereas the control trees took up more sodium. And as salinity increased, the absorption of potassium in the inoculated trees increased. These results show that Glomus fasciculatum fungi increases the health of Acacia nilotica in saline conditions when compared to uninoculated Acacia nilotica. It is reasonable that this species of Glomus and possibly others could benefit other species of trees in saline conditions as well. They found that at the higher level of salt (9.5 dS/m), the mycorrhizae had a harder time being established. Designers might offset this somewhat with swales. This would allow fresh rainwater to hold in the soil, reducing the salt content over time. Where salty water tables are a problem, appropriate trees can be used to pump down the water table, thereby removing salt from the upper levels. Whether or not Glomus spp. could help tree species used in this way to pump down salty water tables remains to be seems; but it is very plausible. A pot experiment was conducted to examine the effect of arbuscular mycorrhizal fungus, Glomus fasciculatum, and salinity on the growth of Acacia nilotica. Plants were grown in soil under different salinity levels (1.2, 4.0, 6.5, and 9.5 dS m(-1)). In saline soil, mycorrhizal colonization was higher at 1.2, 4.0, and 6.5 dS m-1 salinity levels in AM-inoculated plants, which decreased as salinity levels further increased (9.5 dS m-1). Mycorrhizal plants maintained greater root and shoot biomass at all salinity levels compared to nonmycorrhizal plants. AM-inoculated plants had higher P, Zn, and Cu concentrations than uninoculated plants. In mycorrhizal plants, nutrient concentrations decreased with the increasing levels of salinity, but were higher than those of the nonmycorrhizal plants. Mycorrhizal plants had greater Na concentration at low salinity levels (1.2, 4.0 dS m-1), which lowered as salinity levels increased (6.5, 9.5 dS m-1), whereas Na concentration increased in control plants. Mycorrhizal plants accumulated a higher concentration of K at all salinity levels. Unlike Na, the uptake of K increased in shoot tissues of mycorrhizal plants with the increasing levels of salinity. Our results indicate that mycorrhizal fungus alleviates deleterious effects of saline soils on plant growth that could be primarily related to improved P nutrition. The improved K/Na ratios in root and shoot tissues of mycorrhizal plants may help in protecting disruption of K-mediated enzymatic processes under salt stress conditions. The moral of the story reaffirms what we already know: Healthy soils with mycorrhizal fungi allow for healthier plants, particularly in difficult situations.